Seattle’s skyline is changing rapidly with the addition of many high rise buildings, to change things up a bit Amazon built the “ SPHERES”. The Amazon Spheres are built out of glass and metal and they are intended to provide a nature like setting for Amazon employees to have spaces to think outside the box ( cubicles). 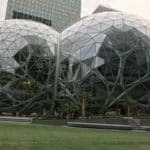 One has to be an Amazon employee to actually visit the spheres but Amazon has opened a visitor center called the Understory that gives people a chance to see inside the design of the spheres. The Understory visitor center is open Monday to Saturday from 10 am to 8 pm and Sundays from 11 am to 7 pm, admission is free and most times you don’t need a reservation but as the weather gets warmer and more visitors come to Seattle it will be a good idea to make a reservation at Visit Understory The Spheres are located at the corner of Lenora Street between 6th and 7th Avenues.